The popularity of The Razor Drifter is rising fast and kids in suburban USA can’t seem to get enough of this little pocket rocket go kart. So what makes this electric go kart so different from all the others that kids are actually leaving their PlayStations and Xbox and going back to spending hours of fun filled moments with their friends or siblings playing outside? What is the Razor Drifter? Basically the Razor drifter is a go kart but not gas powered. So no dangerous gas tank or gas engine that needs to be maintained. Not as noisy and therefore no chance of upsetting your neighbors. Best of all, this little baby is around 50% cheaper that a bottom of the range gas powered go kart. It gets its power from two 12 volt batteries making a top speed of 12mph achievable and allow for about 45 minutes drive time. Not that fast you may think but from all accounts fast enough to give young kids the thrill that they are after but slow enough not be considered dangerous. The Razor Ground Force Drifter go kart has a race tune chassis for a very firm and sporty ride, rubber tires at the front and super slicks at the rear. The acceleration is controlled using your thumb and the rear brake is operated manually also. There is a bucket seat for a comfortable ride and safety features include a study steel frame, safety flag and a shoulder strap to keep your little “precious” ones snug in the seat. The maximum weight recommended for peak performance is 140 lbs. The one main difference however is that the Razor Drifter as the name would suggest can actually drift. This is made possible by means of an upgraded rear axle which increases maneuverability. Why do kids love this electric go kart? The Razor Drifter as I stated before has the ability to “drift” and that is where all the fun is. Kids are power sliding their way through tight corners, throwing fish tails and performing perfect 180 degree turns just like the pros. Don’t get me wrong, this little baby will also function very well if your kids want to take one another on in a fun cul-de-sac race or do a time trial for the fastest lap. In fact, this go cart is perfectly suited to very active 5, 7 and even 14 year olds. Once put together, you will probably find it hard to get your son or daughter away from it as it is so much fun. Why do parents give this toy the thumbs up? The main reason I think is that the kids are finally out of the lounge room just staring at the TV screen with some sort of controller in hand. Finally kids are kids again. The drifter has a way to bring back the old feeling when kids use to gather in a cul-de-sac and play ball for hours. The drifter costs 50% less than a gas go cart. The fact that this go kart is not gas powered has the added safety edge of less speed but enough to still make the ride thrilling. The kart is well made and with low-profile cast-aluminium wheels, a sturdy steel frame meaning that it can take a lot of punishment. Assembly is a breeze and when you have young kids all eager and frothing at the mouth to take that first ride this is I think a very important. All tools are provided for the assembly so no need to go digging in the garage for your tool set. With the easy to control thumb activated accelerator and rear hand brake, this go kart is easy to maneuver. Even kids as young as 5 are giving it a go. The center of gravity is so low that it is nearly impossible to flip over. The drifter is suited to both boys and girls. The Razor Drifter go kart is backed by a 90 day warranty. The whole unit weighs 55 lbs making it easy to store away. It can even be hooked up against the garage wall. Although the drifter will perform well on most surfaces, it is on smooth concrete or road surfaces that the Razor Drifter go kart is most at home. Grass areas can prove to be a bit of a challenge. The reason why smooth surfaces are better is because they allow the cart to actually do what it was designed for and that is drifting. This however has a small drawback as the rear tires can become worn quicker. I guess that’s why they are made of a strong hard plastic. Another important point to consider but not entirely necessary is that parents might also want to get extra protective gear like a helmet for added safety. This Razor Drifter was also designed for controlled environments and should not to be taken into areas with road traffic or hazards. I might also add that the Drifter will probably be more suited to kids between the ages of 5- 10 or just over. Teenagers will mostly find it a little too slow to get the maximum benefit out of it. Having said this, I must also reveal that during my extensive research on this product, I have encountered customer reviews of 14 year olds reporting that this was as good as it gets. So if you are sick of watching your kids wasting their lives shooting or blowing up stuff on a TV screen and would rather have them enjoy a fun filled sunny day outside, the Drifter cart might be just what you are looking for. Shopping online for the Razor drifter is convenient and easy. However the trick is to know where to get a great deal because if you can get the same item at a cheaper price, why wouldn’t you.I have found that price alone does not necessarily mean a great deal but added benefits like free shipping, great customer service and quick turnaround time all add to the online shopping experience. As you may know the Razor Drifter is electrically power and this power is generated from two 12-volt batteries which are located, just behind the driver’s seat. Near the batteries, is an electrical motor which makes the rear tires move. Is it possible to change the batteries when they break-down? Yes, of course these batteries are changeable, because as everyone knows, everything only works for a specific period of time. The lifespan of the batteries is about a year, with regular recharging of course. When your batteries are fully charged, the kart car will work for about an hour. However, some batteries have been known to last a lot less that this period due to manufacturing defects. If this happens to you, just contact Razor and they will promptly send you replacement ones. If the batteries stop working before these 90 days, they are obligated to send you a new set of batteries, or tell you where to take your kart for repairs. After you get a new set of batteries, there will be another warranty period of 90 days for the new set. If something happens to them again, before the expiry of the extended 90 days, you will be able to again ask for a new set of batteries. So keep your receipt as it is important to remember that you have a 90 days warranty period, from the moment when you purchase the car. Another component of the electrical system of the Razor Drifter is its motor, which is the most important part of the car. When the motor is running you can hear a faint sound. There is nothing you need to do about maintenance of the motor, because there is no need to replace like spark plugs or change its oil. The only thing you need to do is to charge the batteries and start the kart. If there is anything wrong with the motor, like a change in its sound or if the motor stops working, you must immediately contact Razor to take care of it. As you probably already know, the Razor Drifter go kart uses a chain mechanism that links the motor to the tires. This chain must not be loose and should be checked and tightened accordingly for the kart to work properly. The last piece of the puzzle, are the tires. There are two front tires which are different from those at the rear. The rear tires are wider than those at the front and made of a hard plastic substance. The reason for this difference is that the rear tires are used for drifting. You should keep a constant eye on the condition of the tires, because as every driver knows, tires wear out with use. This is more so with the Razor Ground Force Drifter as the rear tires can become worn very quickly as they are primarily used for drifting. When this happens you should start looking for new tires as your child will not be able to drift if the kart is has worn out tires. There are a lot of reasons why the Razor Drifter kart is so different from others on the market. First of all this little gem is especially designed for drifting. Although, a large number of toy cars are readily available on the market, only a few have the ability to drift. This is a relatively new sport even for the older drivers. As kids usually try to mimic the big boys, this kart was created to make your little angels feel like the grown-up boys. Drifting is a very exciting sport that is still quite new and unlike normal racing where speed is king, drifting is mostly about control. However the adrenaline rush is still huge and the Razor Drifter although not as powerful or as fast as the real thing, still gives your little ones a ride of their lives. Other than for the fun factor, this car has to be safe as well. Actually safety has been paramount when the guys at Razor designed this kart. The distance between the ground and the frame of the car is about 2 cm thanks to the suspension. The small distance and the great suspension combine to prevent accidental overturning of the kart. The power source for the 12 mph speed is provided by two 12-volt batteries, fitted at the back of the car. While this is not considered as blistering, it is fast enough for little kids without being dangerous. The speed of the car, combined with its small size, and safety features will ensure that your children will not be exposed to dangers beyond your control.However it is always left to you as a parent or guardian to make sure that the environment where the kart is being operated in is a safe one. This is a unique toy and it is designed with the single purpose of creating fun. Every parent on earth would agree that fun must never outweigh safety. That is why the Razor Drifter go kart is solely made with high grade materials. Other than quality build, these karts are relatively easy to drive. All essential control devices, such as the acceleration and the brakes, are fitted on the wheel. Make no mistake, this little car will give your child a little bit of an insight on how a real car should be driven. Razor Drifter Go Kart – Is there anything that’s safer that provides kids with so much fun? Going bananas, wondering what to give your little son for his 7th birthday? Worry no more because if there’s one thing that can thrill your little boy and make him give you the biggest hug in the world, it’ll be the Razor Drifter Go Kart that has taken the world of toys by storm. Especially made for children between the ages of 7-10, the Razor Drifter is similar to the traditional Go Kart we know; with the only difference being that it’s powered by two 12 volt batteries whereas the other Go Kart uses gas for which there is a tank. Not having a gas tank is definitely going to make parents feel safe and secure as far as their children are concerned and the way this little machine is built is sure to make them more than happy to let their kids ride it. Constructed with a strong steel frame to ensure durability, the Razor Drifter has rubberized wheels and tough plastic slicks at the rear while the acceleration and braking can be carried out manually at the touch of a button. It has been built, keeping in mind the very young and therefore it can go only up to a speed of 12 miles per hours, which the slightly older children might think is not fast enough for their satisfaction. But the racer tuned chassis and its drifter aspect is sure to thrill the kids who will be able to take tight corners and turn around fast, throw fish tails and even have races that will provide enough and more excitement for their young age. Shoulder straps that come with the machine ensures the safety and security of the child while anxious parents are always welcome to provide extra safety measures in the way of a helmet, although this is not really necessary considering the fact that the Razor Ground Force Drifter go Kart has been specifically designed with little kids in mind and therefore all safety rules have been gone into very carefully to make this machine as safe as possible. Kids as you know have great creativity and will be able to have endless fun imagining themselves as their time honored heroes or racing drivers and let their spirit of adventure come to the fore. Parents who so far have not been able to persuade their children to get away from their endless computer games and TV watching will now have an alternative to challenge their spirits and there’s no kid on earth that will be able to resist something in the line of the Razor Drifter. Light of weight and sold at half the price one would have to pay for a gas powered Go Kart, The 12 volt batteries will provide sufficient power for the kids to have at least 60 minutes of fun at a time. The batteries have to be recharged for further use and therefore it’s always best to keep a few spares in hand in case your children just cannot wait to have fun with their absolutely amazing Razor Drifter Go Kart. Ever since the invention of cars, every little boy and nowadays girls also dream of sitting behind the wheels and more specifically of being able to drive a sports car someday. That’s probably why most kids prefer the Razor Drifter instead of a bicycle. This is easily explained, because they are looking for something on four wheels. They want something extraordinary which would allow them to do unusual things. The unusual thing here is the 180 and 360 degree turns not to mention being able to zoom around corners.It reminds them of the great movie ‘Fast and Furious Tokyo Drift’. Sharp quick turns can give little ones a little buzz as it they were on a roller coaster. One of the greatest advantages of the Razor Drifter is that it is safer than a bike because there is less of a probability of accidental falls, bleeding knees or pain. First of all, when your child enters the kart and sits on the sport seat, they can feel that they are somewhat in a protective environment. The seat belt is not only there to look good and make your little one feel like the real thing but it is also an added protection that the guys at Razor felt that they had to add to the whole package. The kart car is easier to control than the bike, and the risk of getting hurt is minimal. The important thing is that the Razor Drifter go kart is much slower than the regular bike and is much safer therefore giving you that extra peace of mind. We can also safely say that you child will never get tired of driving the drift kart . Children want to drive the Razor Ground Force Drifter go kart as often as possible since it brings them hours and hours of fun and joy especially when they can repeatedly make incredible turns with it. The only thing that gets tired is the Kart. Unfortunately the batteries cannot last the whole day. Hence, your child will not be able to drive it the whole day. But, the moment they sit behind the wheel of this incredible kart, they instantly feel as if they can do anything. Is it possible to race with the Razor Drifter ? You bet it is! However, the only condition is finding a place large enough and safe enough. Kids will have hours of fun designing their own course and practicing to be the best at drifting. When they fail to win the first time, it forces them to practice more regularly and eventually become the best. Razor Drifter Go Kart – Could this be the alternative to all those mind bending Computer Games? Kids today don’t seem to have any other interests than watching TV or worse still, sitting in front of their computers playing endless games. They are and so fascinated with them that they wouldn’t even know if an earthquake hit them. Parents feel helpless not knowing how to get them out outdoors and make them get involved in the type of games that used to make kids of years gone by run and sweat and enjoy themselves thoroughly. But, could there be something at last that seems to have captured the imagination of children today? And if so, could it be the fascinating Razor Drifter Go Kart? This novel concept is sure to get the kids out into the open because it can bring out the essence of a child with its imaginative design and ability to create excitement. The Razor Drifter go Kart is not very different to the traditional go kart, but is operated through a 12 volt battery that generates sufficient power for it to run for at least 50-60 minutes at 12 miles per hour. The greatest advantage of this machine, as far as parents are concerned is, it being not gas powered like the normal go kart, and as such does not have a patrol tank. Consisting of a tough steel frame with shoulder straps to keep a child safe while on the run, it also has fully rubberized front wheels and super slicks made out of a tough plastic like material at the back. A comfortable bucket seat for easy riding and hand operated accelerator and hand brakes makes it an easily maneuverable machine that can be operated even by very young kids. The specialty of the Razor Ground Force Drifter go kart is its ability to power slide round tight corners and take perfect turns which enhances the enjoyment this machine offer its users. The parts are all ready made to assemble at home and dads will find it no problem at all, while not having to bother about maintenance because of the absence of an engine. The Razor drifter go kart however has specifically been designed for kids around the years 5-10 which is the main reason for the maximum speed of 12 mph. Older kids might find it not exciting enough for them although the little ones will no doubt be thrilled to bits to show off their prowess on the machine. Parents will definitely find this go Kart the perfect product to keep the kids outdoor knowing there’s nothing to fear as far as safety is concerned. Having a very low central gravity there’s absolutely no fear of the machine flipping over; but parents being parents can always take extra precautions by providing a safety helmet for their kids to be used when riding. To get the best performance out of your child’s Razor Drifter, it should preferably be used on a concrete or hard surface since a grassy or gravely area might make it difficult for little kids to maneuver the machine. Being very reasonably priced and light of weight, the Razor Drifter Go Kart will be prove to be an irresistible plaything and most probably the only product manufactured up to now that can be a challenge to those never ending and mind boggling computer games. How safe is the Razor Drifter Go Kart and can kids use it without supervision? Electric Go karts have never been more popular with most parents happy that there’s something exciting enough to get their children out of the house and away from the TV. The Razor Drifter Go kart is a very good toy, (although one cannot call it a toy as such) that can help children to learn about responsibility while driving and also to keep them outdoors at a time when its difficult to wean children away from their computer games and TV consoles. But, like with any other toy, adults must always check how safe this particular machine is before they buy one for their children. The Razor Drifter is ideal for children between the ages 7 and 10 and has actually been designed with this age group in mind. 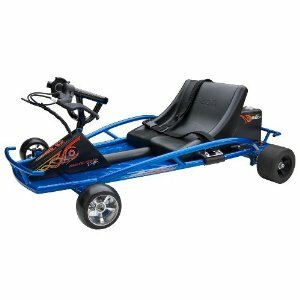 Unlike go karts that are powered by gas, this machine uses the energy of two 12 volt batteries that will provide enough power for close to 60 minutes, after which they must be recharged again for further use. Since it’s made for little kids, the maximum speed it can achieve is 12 miles per hour for which all mums are thankful. However, older children tend to scoff at this speed claiming it’s not fast enough for them. But then again, they do turn up their noses at anything made for the little ones, don’t they? It’s a very strongly made machine that has a steel frame and many tests have apparently been carried out to check how safe it is before it was introduced to the market. The Razor Drifter Go Kart comes with two fully rubberized wheels at the front, slicks at the back while the safety shoulder straps are strong enough to keep the children from falling out when riding. This however is unlikely to happen due to the center of gravity in this machine being so low t. But with kids, you can never say never and parents could always take extra precautions by providing a helmet for the kids to wear when riding. Kids are sure to find the Razor Drifter go kart unbelievably exciting because of the many things they can do with it. Not only can they race each other, as kids will always do, but they can also power slide around corners, perform 180 degree turns just like they see their heroes do and generally have the time of their lives. Parents should however make sure that the Razor Drifter is used only on concrete or hard surfaces because they will not perform well on grassy or gravelly areas. The particular manner, in which this machine has been designed, makes it imperative that it be used only in areas where there is no traffic which is another important factor that parents should be aware of. Dads will have to assemble the go kart once the box is bought home. This however should not be a problem for any father, since all the necessary tools for assembling it together with an easy to use manual with clear instructions is also included. Weighing not more than 55 kg and a price that is half of that of the gas powered go kart, the Razor Ground Force Drifter Go Kart can be considered the ideal gift for any boy or girl for that matter.